The Sossusvlei region in the Namib-Naukluft National Park is one of the most visited tourist attractions in all Namibia. This scenic region is not just all just red dunes, but consists of the Naukluft Mountains, scattered Insel-bergs, savannah and various canyons. This huge area is also home to many desert adapted wildlife and bird species, such as Oryx, Mountain Zebra, Springbok, Ostrich, African Wild cat, leopards, baboons and even the endangered cheetah, with various endemic bird species, such as the rare Dune Lark. The Sossusvlei area is about 4 hours drive from Windhoek via Rehoboth, and about 5 hours from Swakopmund via the Kuiseb Canyons. If driving in from the coast, extreme care should be taken. The road is gravel, with sharp stones in places and sharp curves in the Kuiseb canyon section. Namib Desert in Namibia: Endless space of blue sky and red dunes. Naukluft, Namibia - A photographers dream. The highest dunes in the world at Sossusvlei. The Namib-Naukluft National Park is a collaboration of the Namib Desert Park, and the amazing Naukluft Mountain Zebra Park, as well as areas of the Namibian Diamond Areas in the south of the country. All of this combined with the new trans-frontier regions in South Africa and Angola, will soon create on of the longest and biggest conservation areas in the world, spanning 3 countries. The Namib Desert is home to the world's highest sand dunes at Sossusvlei, second largest canyon, the Fish River Canyon. These are just a few highlights that make our safaris covering the Namib Desert region a popular favourite. The Namib-Naukluft National Park is an extremely diversified conservation area, and very unique. Namib-Naukluft Park is one of the biggest national parks in Africa, spanning much of the central Namib Desert and includes the Naukluft Mountains. The Namib-Naukluft Desert has grown to be a favourite Namibia safari destination as tourists love the wide open spaces, spectacular scenery, and naturally a visit to this region will include the amazing red tinted high sand dunes at Sossusvlei. The Namib Desert includes almost 50,000 sq. km's, and is graded as the 4th largest protected area in the world (the largest nature conservation area in Namibia) with landscapes ranging from extraordinary desert savannah and grass plains, to majestic high sand dunes and deep canyons, offering amazing photo opportunities. Namib Desert is an age-old land with a timeless spirit. It is home to various desert animal species and of the rarest plants in the world. The wildlife found in this harsh panorama include the dainty Springbok, Oryx, and Hartmann’s Mountain Zebra. Here the rare ancient plant, the Welwitschia mirabilis is also found. A strange-looking desert plant, and one of these protected plants is estimated at over 2000 years old. 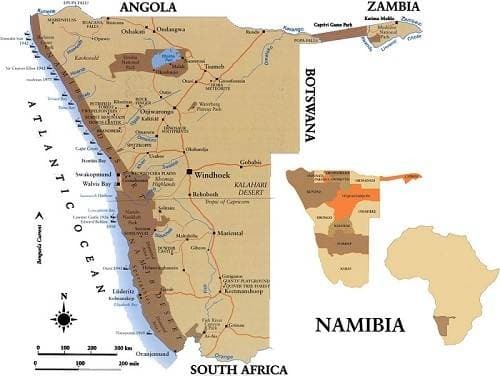 The four main sections of interest in the Namib-Naukluft National Park, is the Naukluft mountains, Sossusvlei fossil dune section and the small Sesriem canyon, the huge Namib Desert section and the Sandwich Harbour area on the Atlantic coast. The Sossusvlei dunes are part of the greater Namib Desert. Sossusvlei taken its name from the Afrikaans word ‘vlei’ which indicates ‘shallow depression filled with water’ or ‘marsh’. This explanation is rather appropriate as Sossusvlei is in fact a dry clay pan; clay typically traps water, so when it do rain, the water gather in the Sossusvlei pan, till the sun and wind evaporates it. While there is water in the pan, it is the only source of drinking water for many animals and birds are to be found in the area. The "sossus" part of the name come from the San / Nama language, meaning "where water gathers". Even being desert, it some-times do receive a light rainfall, and even some snow on a few rare times. The red dunes of Sossusvlei was formed around 15 million years ago, by the dumping of Kalahari sand from the Orange River into the Atlantic Ocean. Which in turn deposit it back along the Namibian coast, and strong winds moved the sand inland. Between the ocean and the wind, the dunes in the Sossusvlei region was created. Sossusvlei is fed by the Tsuachab River, which originates in the Khomas Highland, and than run along the east of the Naukluft mountains, before cutting into the dunes to end at Sossusvlei. The entrance to the Sossusvlei dunes are at the Sesriem gate of the National Park, and than another 65 km from the Sesriem gate via the dune valley to the pan. The highest of the dunes measured was just over 310 meters, and it is generally explained: the older a dune, the brighter red the colour of the sand. The shades of red comes from the ferric (iron) oxide binding with the silica sand grains, that has created the rich red shades seen on the dunes.